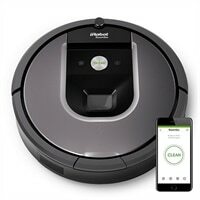 Roomba® 960 Wi-Fi® Connected Vacuuming RobotThe Roomba 960 Vacuuming Robot seamlessly navigates room to room to clean an entire level of your home, recharging and resuming until the job is done. Roomba 960 loosens, lifts, and suctions dirt with up to 5x more air power and requires less maintenance. Just press CLEAN or schedule Roomba on the go with the iRobot HOME App.